An Attorney specializing in complex litigation with more than 37 years of experience, Ted Lyon has represented clients in more than 150 jury trials and was named one of the Top 100 Lawyers in America by the American Trial Lawyers Association from 2007 through 2013. Ted served in both the Texas House of Representatives (1979-1983) and the Texas State Senate (1983-1993). He has also served as a police officer, a licensed fishing and hunting guide and a teacher. Ted has received numerous prestigious and meaningful awards including the 2012 Teddy Roosevelt Conservationist of the Year award. At the outbreak of the Korean War, Will Graves volunteered for the U.S. Air Force and was trained as a Russian linguist. In order to accelerate and develop his skills in Russian, he started reading Russian wildlife magazines and books. Wolves were often discussed and soon his interest focused on wolves in Russia. He asked every native Russian he met if they had any knowledge of wolves and began to record data and resources. Graves’ interest in wolves grew into a serious hobby that continued after the war. Rob Arnaud is a fourth generation Montanan who grew up Manhattan, MT. His love of the outdoors and hunting led him to study animal science at Montana State University where he graduated with a B.S. in 1980. He has been the contracted wildlife manager and outfitter on several large ranches in the west as well as serving on a private wildlife board. He is a licensed outfitter in Montana, Wyoming and California. In total, he provides trophy hunting opportunities on sixteen different ranches. He is also the President for Montana Outfitters and Guides Association and is very active in lobbying for hunter rights and responsible wildlife management. Rob is fortunate to have hunted many of the North American animals. Laura Schneberger ranches with her husband and children in Southwestern New Mexico on an historic cattle ranch located in the Black Range of the Gila Forest. She spends as much time as possible educating the public and writing articles on the realities of wolf reintroductions and their impacts on families and small communities that depend on livestock production for an economic base. Living in the middle of wolf and mountain lion territory has made her a much sought expert of wildlife activity in the Southwest. Karen Budd-Falen, with her husband Frank Falen, is the owner of the Budd-Falen LawOffices, L.L.C. located in Cheyenne, Wyoming. Before moving back to Wyoming, Karenserved for three years in the Reagan Administration, U.S. Department of the Interior,Washington, D.C., as a Special Assistant to the Assistant Secretary for Land andMinerals Management. She later served as a law clerk to the Assistant Solicitor forWater and Power. Karen has also worked as an attorney at Mountain States LegalFoundation, a conservative public interest legal foundation in Denver, Colorado. Matthew A. Cronin is a Research professor of Animal Genetics at the University of Alaska Fairbanks, School of Natural Resources and Agricultural Sciences. He received a Ph.D. in Biology from Yale University in 1989, an M.S. in Biology from Montana State University in 1986, and a B.S. in Forest Biology from State University New York, College of Environmental Science and Forestry in 1976. Dr. Cronin was a U.S. Coast Guard officer from 1981 to 1984, and worked for the U.S. Fish and Wildlife Service as a geneticist from 1989 to 1992. From 1992 to 2004 he worked in the private sector with a focus on wildlife research and impact assessments for the oil, timber, and mining industries. In 2004 Dr. Cronin was appointed to the university faculty and focused his research on population genetics of wildlife and livestock. His work emphasizes proper application of science to natural resource management and his experience with private industry, academia, and government provides insights for achieving multiple use objectives. Heather Smith Thomas grew up on a cattle ranch near Salmon, Idaho and started writing about horses and cattle in high school and college. She graduated from University of Puget Sound (Tacoma, Washington) in 1966 with a BA in English and history. Since then she’s written more than 10,000 stories and articles for livestock and equine publications and 20 books. She and her husband Lynn Thomas have been raising beef cattle and horses since 1967. Heather writes regularly for more than 25 farm and livestock magazines and 30 horse publications. She has published numerous books on horse care and cattle raising, and also wrote BEYOND THE FLAMES: A FAMILY TOUCHED BY FIRE, which details her daughter’s severe burn injuries and how this affected their family and changed their lives. 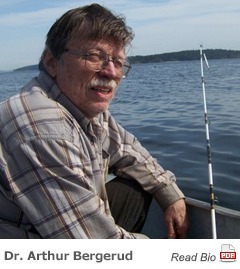 Dr. Arthur Bergerud has been a population ecologist involved in research on caribou populations in North America since 1955 and is considered the world’s foremost authority on the woodland caribou. His 30-year study (1974 to 2004) of two caribou populations, one in Pukaskwa National Park (PNP) and the other on the Slate Islands in Ontario, is considered the most comprehensive study of caribou ever done. Along with Stuart N. Luttich and Lodewijk Camps, Bergerud authored the The Return of the Caribou to Ungava (2008), which is the story of the George River caribou herd that increased from 15,000 animals in 1958 to 700,000 in 1988 – becoming the largest herd in the world at the time. For over 20 years, Bergerud, who is the former chief biologist with Newfoundland and Labrador’s Wildlife Division, and his associates, studied the George River herd all across Canada’s tundra and taiga. Cat Urbigkit is an award-winning writer and photographer who lives on a Wyoming sheep ranch, where she finds daily inspiration for her work. In addition to eight nonfiction books for children, Cat has written two adult nonfiction titles, including Yellowstone Wolves: A Chronology of the Animal, the People, and the Politics, of which an adaptation appears in this volume. Shepherds of Coyote Rocks: Public Lands, Private Herds, and the Natural World is an action-packed true story of her journey alone to spend a season on Wyoming’s open range, tending to a flock of domestic sheep as they give birth amid the challenges of nature—from severe weather to a wealth of predators. Her only companions are the guardian animals that repeatedly prove their worth in their devotion to protecting the flock. The book reveals the broad spectrum of the human relationship with nature, from harmony to rugged adventure. Cat’s newest title, When Man Becomes Prey, is slated for release in the fall of 2014 and examines fatal encounters between humans and five North American predator species. When it comes to the science of big game animals of North America, no one person is more recognizable as an expert than Dr. Valerius Geist. Dr. Geist is Professor Emeritus of Environmental Science, Faculty of Environmental Design at the University of Calgary in Calgary, Alberta, Canada. This tremendously condensed biography of his scientific accomplishments in the worldwide wildlife community hardly does him justice and has been shortened only due to space limitations. As an educator, author, consultant and public servant, Dr. Geist has been honored annually since 1972 with just about every major conservation honor imaginable. His books – there are nearly 20 of them, including one on Russian wolves – are considered the “bibles” for their subject matter among Dr. Geist’s peers.He has consulted with wildlife agencies throughout the world on large mammal ecology and taxonomy in relation to conservation legislation, industrial developments, land-use conflicts and in developing terms of reference for environmental impact assessment. Dr. Geist has chaired and served on numerous scientific and wildlife boards with worldwide implications.Dr. Geist has contributed entries in for encyclopedias, testified as an expert witness in many court cases, published popular articles in many magazines and has published technical papers in the top science publications throughout the world and in several languages. Don Peay earned his BS in Chemical Engineering and MBA degrees from Brigham Young University. After working at an aerospace firm, he started his own engineering consulting firm, Petroleum Environmental Management, Inc. With deer herd populations crashing, ranchers wanting to greatly reduce Utah’s elk herds, and a fish and game agency saying the future was nonhunting programs, Don founded Sportsmen for Fish and Wildlife in 1994. Since then, Don has received numerous conservation awards in Utah and throughout the west, including Outdoor Life naming him one of the Top 25 Conservationists in North America in 2008. In 2009, the Utah Legislature passed a unanimous resolution thanking Don for his work to help the military veterans, protect wildlife and their habitats, increasing jobs and tourism for Utah and increasing quality hunting opportunities. Sportsmen for Fish and Wildlife has played a major role in the Establishment and obtaining the funding for the 750,000 Acre Watershed Restoration Act, and helped increase funding for wildlife and land conservation by more than $200 million. SFW gave sportsmen in Utah a voice - a state that had been dominated by non wildlife friendly interests. SFW also worked to restore world class trophy bull elk on Utah’s public lands, lead the aggressive effort to transplant new herds of bison, antelope, wild turkey, mountain goats and bighorn sheep, and has recently been the lead group to see Utah’s legislature and Governor sign the Mule Deer Recovery Act. Don and his wife Susan have four children. They enjoy traveling, and all forms of outdoor recreation. Jess Carey has lived in Reserve, New Mexico, for 35 years. Trained in woods skills by his father over 50 years ago has been an asset in his job as Catron County Wildlife Investigator, which he has done since April 2006. After graduating from high school Carey did a three year tour of duty in the U.S. Marine Corps. Carey served as the elected Sheriff, Under-sheriff, and Investigator for the 7th Judicial District Attorney’s Office in Catron County. A native Montanan, Linda Grosskopf has lived in Japan for nine months and in Tatarstan, Russia, for eight months. She infinitely prefers God’s country and seldom travels and then reluctantly. Linda holds a Bachelor of Science degree in Secondary Education with an English major and a Secretarial Business minor, which degrees she put to work in several career fields since graduation. Linda has spent 16 of the last 19 years as editor of three well-respected weekly ag papers published in Billings, Montana, and is now editor of Western Ag Reporter. In that position, she has earned a reputation as a tell-it-like-it-is newswoman, and she enjoys an unusually close relationship with her vast and diverse readership. Her passion, however, is preserving history—the stories and the photographs—for the generations to follow. Linda has written, edited, and/or published numerous family and ranch histories (see website wordwrightwomen.com). Her first major writing project, On Flatwillow Creek: The Story of Montana’s N Bar Ranch, published in 1991, literally changed her life. Since then, she has edited No Better Bull, the autobiography of Les Leachman, 2003; co-authored Setting the Record Straight: The R-CALF Story, 2006; compiled and edited Treasures from Bill’s Warbag, a collection of true stories written by her great-grandfather, Bill Huntington, 2006 (see website billhuntington.com ); authored Challenges Above and Beyond, the biography of former Montana Governor Tim Babcock, 2008; co-edited The Weak Ones Turned Back, The Cowards Never Started: A Century of Ranching in Montana, 2009; co-edited Charlie Russell: The Cowboy Years, Volumes I and II, by Jane Lambert, 2011; edited Visions and Voices: Montana’s One-Room Schoolhouses by Charlotte Caldwell, 2012; authored As I Saw It, the biography of Pat Goggins, 2012; and co-edited Since the Days of the Buffalo: A History of Eastern Montana and the Kalfell Ranch by Michael Bugenstein, 2013. Once she’s done editing The Real Wolf, Linda’s next large project will be the history of ranching on Montana’s Crow Reservation for which she’s been collecting material since the late 1980s. Ranch-raised in the midst of a multi-generational family located on Indian Creek east of Billings, Montana, on the ranch that’s been in her mother’s family since the early 1930s, Linda lives today just a couple of miles north of the family ranch with two Border Collie dogs, a barn full of cats, a pasture full of saddlehorses, an old longhorn steer, and a cowboy husband that sells ranch real estate. Linda’s spare time is joyfully spent horseback on the family ranch, cowboying with her brother Mike, nephew Clint, and an assortment of treasured family and friends. Surrounded by four generations of family, Linda considers herself blessed to live and work in God’s country. Also a native Montanan, Nancy Morrison received a Bachelor of Science in Applied Management from Rocky Mountain College. Since 2005, she has been the Accounting Director for the Billings Association of Realtors. That position has not, however, prevented her from being closely involved with many of Linda’s book projects. As Linda’s younger sister, it has been a natural occupation to provide the frank critique necessary to every busy writer and to offer, as a counter-balance to Linda’s tell-it-likeit- is manner, an artistic, intuitive tone. Nancy’s interests in graphics, design, and composition complement Linda’s direct style. After years of “editing the editor” behind the scenes, in 2009, Nancy moved to the front line with the co-editing of two worthy projects: The Weak Ones Turned Back, The Cowards Never Started: A Century of Ranching in Montana, published in 2009, and Charlie Russell: The Cowboy Years by Jane Lambert, published in 2011. More recently, Nancy formatted and co-edited two autobiographical books by Al Anderson, Growing Up, Writing Down, Volumes I and II, which were published in 2011 and 2012. When Linda’s project, Pat Goggins: As I Saw It, desperately needed an infusion of energy and organization, Nancy went to the keyboard, once again, and helped bring the book to completion. Nancy co-edited Since the Days of the Buffalo: A History of Eastern Montana and the Kalfell Ranch by Michael Bugenstein, published in 2013, and when additional material became available, she edited the second edition of Charlie Russell: The Cowboy Years by Jane Lambert, published in 2013. Never comfortable with too much free time, Nancy volunteers as Operations Treasurer for the Friends of Montana PBS and is currently slated to help with Montana PBS’ upcoming program about Charlie Russell—scheduled to air in 2015. She also works with ceramics, draws and paints, and plays the flute in the community orchestra. Her large extended family provides a built-in community and a wide variety of never-ending commotion.